The Ice Cream banana, also known as the Blue Java banana, is highly regarded as one of the best tasting Musa varieties of all time. This is mainly in part due to the plants light vanilla, ice cream flavor, and creamy texture. The outer skin of the fruit is a beautiful blueish-green. The fruit will maintain it's amazing amazing flavor whether it is eaten raw or cooked! This species is aromatic and described as having a pleasant vanilla fragrance. This cultivar is cold tolerant, and easily adaptable to sub-tropical and temperate climates! It is fast growing, easily capable of reaching heights of 15-20 ft! Even if Ice Cream Banana freezes back in the winter, it will regrow as long as temperatures don't dip lower than 20 degrees. The 'Ice Cream' Banana cultivar is well suited for containers, as long as it is over-wintered indoors. 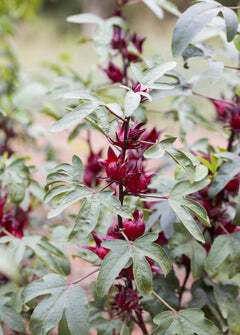 This plant is especially useful in landscaping for providing shade. It also makes a lovely and attractive ornamental, especially with the unique color of the blue banana fruits. Not all Bananas are created equal! The Musa species features great diversity in variation and form, and there are several cultivars that have been developed through selective breeding over time. The end result is several variations of bananas that range in flavor, size, taste, and color! One really unique and awesome example is the ~Ice Cream~ banana. Soil & Moisture: Rich, well-draining soil high in compost and organic matter. Needs consistent moisture during warmer months until trees are well-established. Climate Zones: USDA plant hardiness Zones 8+.